متولی عنبران, سید هانی, انتظار سعادت, وحید. (1397). توسعه مدل توزیع دما و شار گرمایی در یک مقطع عمقی چندلایه با درنظرگرفتن مؤلفه‌های تولید گرما و رسانش گرمایی. مجله ژئوفیزیک ایران, 12(3), 145-154. سید هانی متولی عنبران; وحید انتظار سعادت. "توسعه مدل توزیع دما و شار گرمایی در یک مقطع عمقی چندلایه با درنظرگرفتن مؤلفه‌های تولید گرما و رسانش گرمایی". 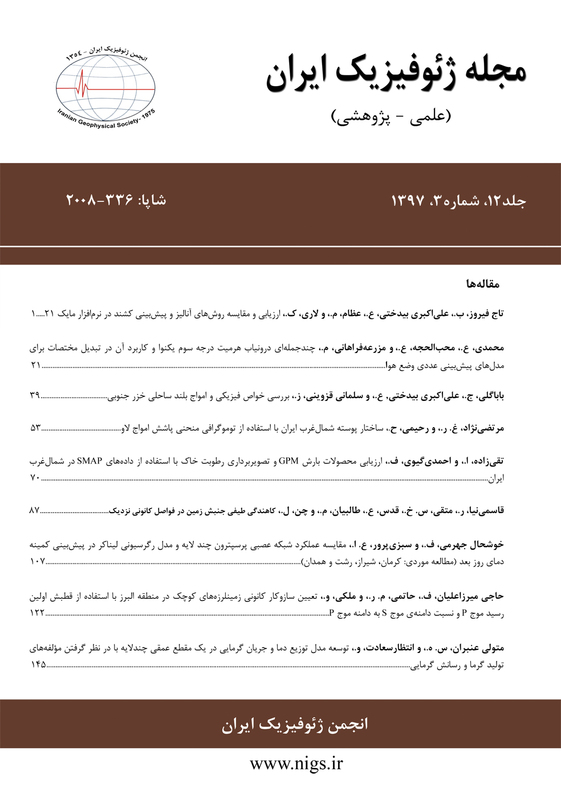 مجله ژئوفیزیک ایران, 12, 3, 1397, 145-154. متولی عنبران, سید هانی, انتظار سعادت, وحید. (1397). 'توسعه مدل توزیع دما و شار گرمایی در یک مقطع عمقی چندلایه با درنظرگرفتن مؤلفه‌های تولید گرما و رسانش گرمایی', مجله ژئوفیزیک ایران, 12(3), pp. 145-154. متولی عنبران, سید هانی, انتظار سعادت, وحید. توسعه مدل توزیع دما و شار گرمایی در یک مقطع عمقی چندلایه با درنظرگرفتن مؤلفه‌های تولید گرما و رسانش گرمایی. مجله ژئوفیزیک ایران, 1397; 12(3): 145-154. بخش قابل‌توجهی از گرمای مشاهده شده در سطح زمین، در مرکز زمین تولید می­شود و بخشی دیگر نیز حاصل واپاشی مواد پرتوزا در پوسته است. این گرما با روش­های هدایت و همرفت، به سطح زمین منتقل می­شود. دانستن شیب حرارتی زمین می­تواند در برآورد میزان بلوغ و دگرگونی مواد آلی هیدروکربن­زا و برآورد سن نسبی هیدروکربن­زایی سنگ منشأ مفید باشد. اهمیت محاسبه توزیع دما و شار گرمایی در زمین آنجا مشخص­تر می­شود که می­توان این اطلاعات را به سایر پارامترهای فیزیکی زمین نظیر چگالی، سرعت امواج لرزه­ای، خواص شیمیایی و ذوب بخشی تبدیل کرد و از آنها برای مدل­سازی دقیق­تر ناهنجاری­ها و لایه‌بندی‌های زیرسطحی استفاده کرد. شناخت اولیه زمین­گرمایی می­تواند در صنعت اکتشاف و تولید نفت و گاز به‌‍‌ویژه در طراحی ترکیب گِل حفاری، سیمان، ابزارهای لاستیکی درون­چاهی، به‌کارگیری ابزارهای نمودارگیری و دستگاه­های الکترونیکی درون­چاهی و طراحی لوله­های حفاری به‌کار‌گرفته‌شود. در این مطالعه، معادله­ای توسعه داده شده است که نحوه توزیع دما و شار گرمایی را برای یک مقطع عمقی با تعداد لایه دلخواه حساب می‌کند. هر لایه، تولید گرما و رسانش گرمایی مختص به خود را دارد. شرایط مرزی برای این محاسبه، انتقال گرما در راستای قائم و صرف‌نظر کردن از انتقال جانبی گرما و معین بودن دمای کف پایین­ترین لایه و سطح بالاترین لایه است که در حالت واقعی (زمین) معمولاً دمای کف سنگ­کره و دمای سطح زمین درنظرگرفته‌می­شود. برای راستی‌آزمایی، این معادله در محیط برنامه­نویسی متلب توسعه داده شده و نحوه توزیع شار گرمایی و دما برای مدل­های مصنوعی محاسبه شده است. Plate tectonics provides a general framework for understanding the worldwide distribution of seismicity, volcanism, and mountain building. These phenomena are largely associated with plate interactions at plate margins. The basic mechanism responsible for plate tectonics must provide the energy for the earthquakes, volcanism, and mountain building. The only source of energy with sufficient magnitude is the heat from the interior of the Earth (~30 milliwatts per square meter). This heat is the result of the radioactive decay of the uranium isotopes 238U and 235U, the thorium isotope 232Th, and the potassium isotope 40K as well as the cooling of the Earth (~30 milliwatts per square meter). An accurate estimate of the heat lost from the interior of the Earth can be obtained from measurements of the surface heat flow. By figuring out the temperature distribution in different depths of the Earth, it is possible to plot the heat flow diagram for those areas. Investigation of geothermal gradient is useful in estimating the maturity and transformation of hydrocarbon organic materials and estimating the relative age of hydrocarbonization of the source rocks. The importance of temperature and heat flow distribution calculation can be more obvious when we relate them to other physical parameters such as density, seismic velocity, chemical composition and melt fraction and use these parameters to more accurate modeling of anomalies and sub-surface layers. Primary understanding of geothermal gradient can be very applicable in oil and gas exploration and production; particularly in designing the combination of drilling mud, cement, rubber tools inside the well, using of digitization tools and electronic devices in the well and designing the drilling pipes. The basic relation for conductive heat transport is Fourier’s law, which states that the heat flux at a point in a medium is directly proportional to the temperature gradient at that point. Using Fourier’s law, it is possible to compute temperature and heat flow distribution in a one-layer section, with boundary conditions such as given surface heat flow and surface temperature. In this paper, we use Fourier’s law and present a new formula which calculates the temperature and heat flow distribution for a depth section with desired number of layers which each layer has its own heat production and thermal conductivity. The boundary conditions for this calculation are the given temperature of the uppermost and lowermost layer and a steady state vertical heat conduction with no lateral heat variation. This is not far-fetched, because there are two boundaries with defined temperature in the Earth: LAB and surface of the Earth. So, we can determine the temperature and heat flow distribution for a lithospheric section with various number of layers with different thermal conductivity and heat production. For verification, this formula was written in MATLAB programming software and the distribution of heat flow and temperature for the synthetic models were calculated. مطیعی، ه.، 1374، زمین شناسی نفت زاگرس، 1، انتشارات سازمان زمین شناسی ایران. Afonso, J. C., Rawlinson, N., Yang, Y., Schutt, D. L., Jones, A. G., Fullea, J., and Griffin, W. L., 2016, 3‐D multiobservable probabilistic inversion for the compositional and thermal structure of the lithosphere and upper mantle: III. Thermochemical tomography in the Western‐Central US: Journal of Geophysical Research, Solid Earth, 121(10), 7337-7370. Allen, P. A., and Allen, J. R., 2013, Basin Analysis: Principles and Application to Petroleum Play Assessment, John Wiley & Sons. Entezar-Saadat, V., Motavalli-Anbaran, S. H., and Zeyen, H., 2017, Lithospheric structure of the Eastern Iranian plateau from integrated geophysical modeling: A transect from Makran to the Turan platform: Journal of Asian Earth Sciences, 138, 357-366. Motavalli-Anbaran, S. H., Zeyen, H., and Ardestani, V. E., 2013, 3D joint inversion modeling of the lithospheric density structure based on gravity, geoid and topography data—Application to the Alborz Mountains (Iran) and South Caspian Basin region: Tectonophysics, 586, 192-205. Motavalli‐Anbaran, S. H., Zeyen, H., Brunet, M. F., and Ardestani, V. E., 2011, Crustal and lithospheric structure of the Alborz Mountains, Iran, and surrounding areas from integrated geophysical modeling: Tectonics, 30(5). Turcotte, D., and Schubert, G., 2014, Geodynamics, Cambridge University Press. Zeyen, H., Ayarza, P., Fernàndez, M., and Rimi, A., 2005, Lithospheric structure under the western African‐European plate boundary: A transect across the Atlas Mountains and the Gulf of Cadiz: Tectonics, 24(2).